For centuries pearls have become to symbolize things that are good, pure and beautiful in the world. 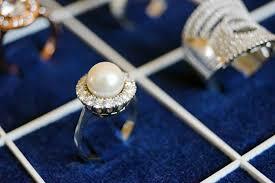 Certainly, the wearing of white pearl rings as an engagement ring has become increasingly popular. In fact, they are becoming just as popular as diamond solitaire engagement rings are. As you will see below there are several kinds of pearls that can be used today in creating an amazing white pearl ring. Whatever design you choose you are going to be adding a stunning piece of jewelry to your collection. White pearl rings can be delicate and graceful pieces of jewelry, they will add a touch of style and elegance to any outfit you choose to wear such with. But before we offer up some tips on how to go about selecting the perfect white pearl ring for you or a loved one, let us take a look at the kinds of pearls used to create so many wonderful white pearl ring designs. These pearls are grown on pearl farms and all the oysters used to produce pearls here have been raised on the farms. They will only be used once they have reached maturity. These are among the most affordable types of white pearls used today as they can produce thousands of pearls during one harvest. These types of pearls are grown both in Japan and Chine, but with Japan being the main producer of these beautiful pearls. They vary in size from 2mm up to 10mm in diameter, but the 10mm sized white pearls are rare. As it takes longer for the oysters to produce such pearls for inclusion in say a white pearl gold rings fewer of them are produced. This, of course, increases their value, yet they are still an affordable option compared to some other pearls. This is the largest of all the pearls that are now being produced and are grown in Australia, Indonesia, and the Philippines. On average the pearls that the South Sea oyster produces measure between 9mm and 20mm in diameter. Like the other pearls mentioned above these come in a wide variety different shades of white. Every woman should have the opportunity to be able to have at least one white pearl ring, as it is the perfect piece of jewelry that will add a touch of sophistication and elegance to any outfit. As you can see from our collection there are many different types of white pearl rings to choose from. Before we offer up some really useful tips to help you purchase the perfect ring for you or someone you care deeply for let’s take a look at the kinds of white pearl ring designs you can select from. Like a diamond solitaire, this type of ring features a single white pearl in either a gold or silver metal setting. They may be simple in design but are also graceful and elegant without any hint of flashiness to them. Such white pearl rings have a subtle, quiet look to them that can be embellished through the adding of other gemstones and the metal setting having an intricate design to it. This style makes the perfect ones to be worn as pearl engagement rings. This style of ring comprises several gemstones set in a cluster or a row. The ring will either be a mix of pearls that vary in size or include one large white pearl to which other gemstones such as diamonds or sapphires have been added. These aren’t that big in size, so are suitable for wearing with a wide array of different outfits. These types of white pearl rings will contain larger size pearls in their design. They tend to be ornate yet very glamorous as well and are often worn as a statement piece of jewelry on their own. A great many modern pearl cocktail rings will follow the latest trends when it comes to statement pieces of jewelry. They will have a much more daring look to them but are perfect for wearing with more formal outfits that you would tend to wear to a black-tie event. Now you know what style of white pearl rings are available the next thing you have to consider is the size of the pearl yours will contain. Any white pearl ring is very versatile and very easy for you to pair with nearly every outfit in your wardrobe. 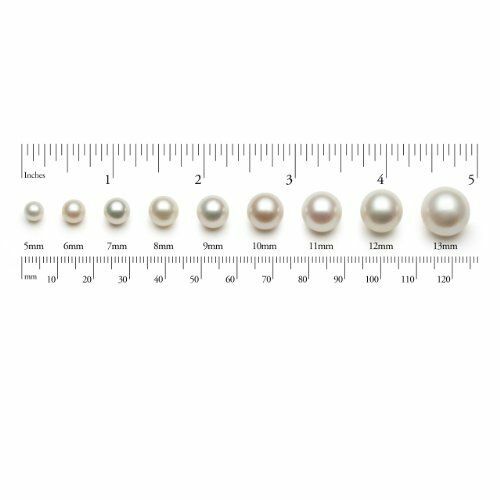 But you need to think carefully when it comes to choosing the right size pearl, as it will help to epitomize certain personality traits of the person wearing it. This is a very delicate pearl and wouldn’t look out of place in any gold and white pearl ring. This is the kind of ring that graceful women who take notice of the finest details around them will love wearing. Because of their size, these types of white pearl gold rings are perfect for wearing every day, whether out to lunch with friends or to the office. You can further enhance the beauty of such a piece of jewelry by teaming it up with a beautiful pair of white pearl stud earrings. A medium sized pearl is the right choice for women who can easily adapt to any given situation. Even a simple silver and white pearl ring will enable any woman who loves to change looks often to look perfect no matter the situation or event. Such white gold and pearl rings are perfect for wearing to the office or just out for a nice meal with your partner. Pearls this size will always be used in the creation of a statement white pearl ring design. Such white pearl rings will really allow you as the wearer to stand out and shine. This is perfect for those women who are a little extrovert and aren’t afraid to be the center of attention at any event. Of course, remember that the larger the pearl in the ring then the more you will have to pay for this piece of jewelry. So it is important before you begin your search that you set yourself a budget and wherever possible keep to this. Rings are a very intimate piece of jewelry and will often be worn every day. So it is important that from the various different kinds of white pearl rings in our collection you choose one that fits well and feels comfortable. So before you go ahead and make such an important purchase you need to make sure you choose the right size ring for your finger. To help you with this selection we offer some tips you may find useful that will help you to choose the correct size white pearl ring. Make sure that you measure your finger at the end of the day as this is when they are at their largest. You should only measure your finger when your hands are warm. If they are cold allow them to come up to room temperature first. The width of the ring is a very important factor to be considered in order to determine the right size for your finger. For example, a wither ring is much wider and therefore you may find you need to be buying any such white pearl rings in a slightly larger size compared to your finger. This is because these types of rings actually cover more of the finger. To measure your finger, take a piece of string or paper and put it around the finger on which you intend to wear say white pearl silver rings. Then make a note of where the two ends of the string or paper meet. You may find asking a friend or family member to help would prove useful. Now take the piece of string or paper and measure it against a ruler and this will tell you the circumference of your finger. Now you need to divide this figure by 3.14 and it will then tell you what the diameter of your finger is. Once you have all this information together you are now ready to begin your search for the perfect white pearl ring. White pearl rings are the kind of jewelry that you will find yourself wearing time and time again, so you won’t feel any regret about investing in such a fine piece of jewelry. Not only does such a ring look lovely when you pair it with that little black dress, but it will also add a touch of glamour to more casual attire. Their luster and shape will really enhance any outfit without overtaking and by pairing with other pieces of pearl jewelry will really give a whole new look to any outfit that you choose to wear your white pearl rings with. Here at PearlsOnly.com, we have a lovely selection of white pearl rings to choose from, so you are sure to find one that suits not only your tastes but also your budget.